I recently got the chance to try out a new Pre-Paid Credit Card from Card.com and you will never believe all the design selections that you can chose from! They literately blew my mind! They're were tons to chose from! I was able to chose any design that I liked... It was a tough choice between Carebears and the Your Love and Luck design, that I finally chose. I'm very happy with my choice, one of my favorite things about my new Pre-paid credit card is that I can set up direct Deposit from Paychecks, Banks, Paypal, etc! When I went shopping and got the chance to use my card in public (other than the online shopping that I was able to do!) People LOVE my card! I've been asked over and over how I got the cool design onto my card as well as had many compliments on my pretty pink credit card! I've happily replied each time: "I got my card at Card.com and you can chose from LOTS of cool designs!" It's been a big hit with all of my friends and family as well as many strangers! The Your Love and Luck design is beautiful and unique - One of a kind - In my eyes (I understand that anyone can chose the same design as me but I like to believe that mine is One-Of-A-Kind hehe) Loran and Jade even like my new card. They said that when they grow up, their going to get a pretty Credit Card... Just Like Mommy!! I love my little girls! They are growing up WAYYY to fast! All in all - I couldn't be happier with my new Pre-Paid Credit Card. I'll have to set up my direct deposit soon. I'm thinking about having alot of my blog payments sent over to the card so I can keep using it and not have it canceled! It's too pretty and useful to be forgotten about! What kind of Card Design would you like to have? If you would like to learn more about the new Pre-Paid Credit Cards from Card.com - You can find all kinds of information on their Website! It's FRIDAY!!!! The end of the work and school week and this weekend just happens to be a long one! How to you feel about a Foto Friday? 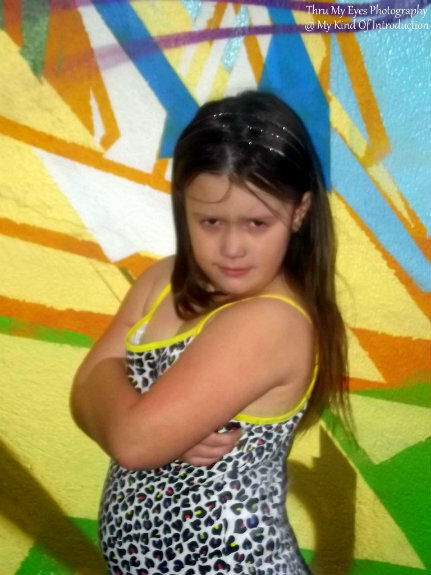 I took my daughters downtown last weekend for a photo shoot and I would love to share some of those photographs with you. What better way then to launch a new segment? 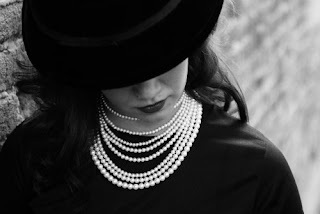 Tell me what you think :) I love feedback on my photography! 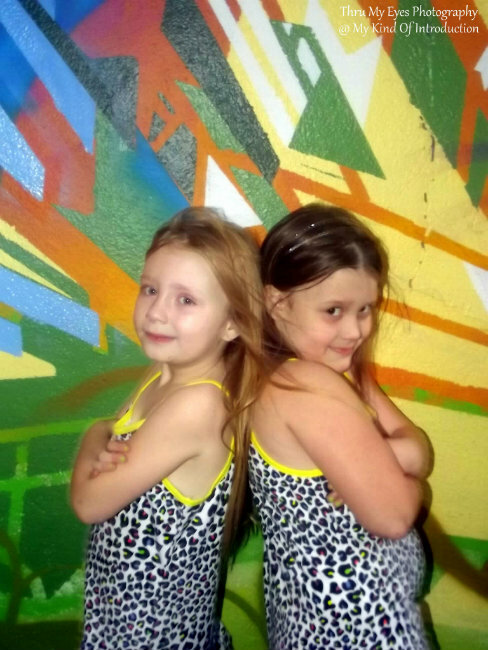 I decided to let the girls chose their own poses since that's when their true personality shines. 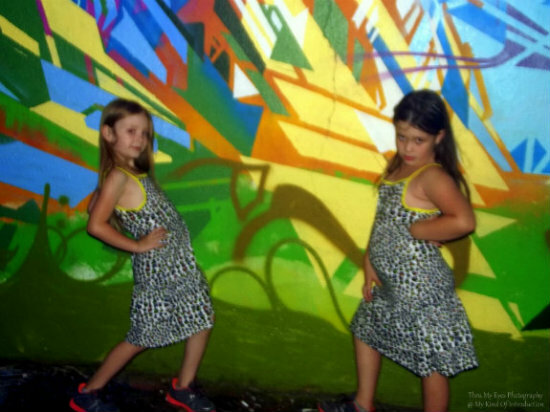 The shot below was the first one I took during the actual photo shoot (I took many more on out way to the wall), it turned out a bit blurry but I can't get over the poses they chose :) They are The Dancing Diva's after all!! Irish Twins - You'd think they were connected at the hip! They won't do anything without the other. The photo below is the above part of the wall that didn't make into the photographs. 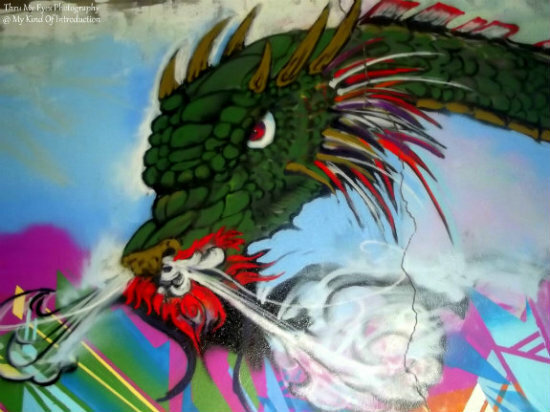 (My girls were too short to have the dragon in their pictures) I chose this wall for our shoot because of the bright colors and who could overlook the HUGE dragon that stretched across the top of the brick wall?! Isn't is amazing? Such a wonderful art piece! Being able to walk around downtown and find beautiful pieces of art painted on the buildings is one of the wonderful things about Asheville, NC! We believe that artists need to be seen and many local business have even hired local artist to turn their outside walls into one of a kind art pieces, some even have the store name and even a product or two :) You can even find murals that tell a story about history. They are all simply breathtaking! 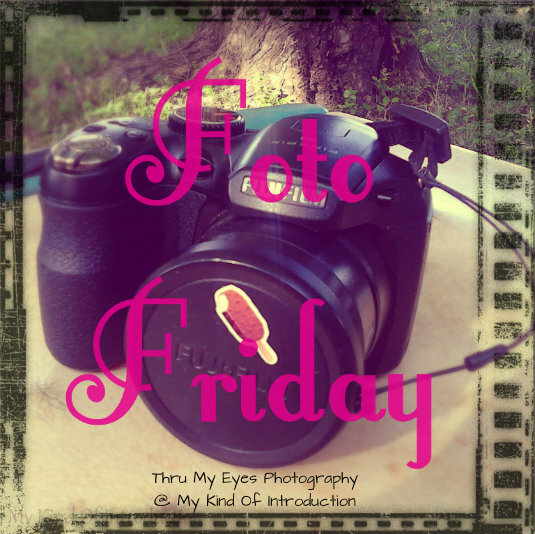 I hope you enjoyed this weeks Foto Friday! Don't forget to check back next week, you never know kind of foto's I may have in store! Disclaimer: - I received the book mentioned below complimentary from the sponsor in return for my honest thoughts and opinions. All opinions are all my own and may differ from your own. Even though some sort of compensation may have been received, I only write about products that I have personally used and/or believe my readers will enjoy or benefit from. I am disclosing this in accordance with the Federal Trade Commission's 16 CFR, Part 255: "Guides Concerning the Use of Endorsements and Testimonials in Advertising." Their faith became their freedom! 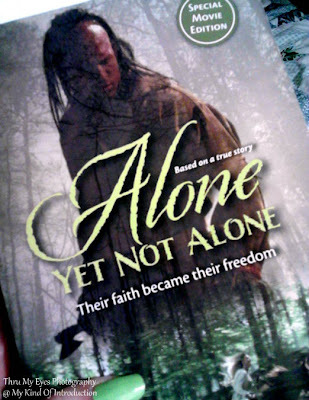 "Alone Yet Not Alone" is an amazing historic book about faith and family, based in the fall of year 1755 during the French and Indian war and is recommended for children ages 8 and older. It's a book that they are guaranteed to love, you will also enjoy the story just much as your kids, I promise you that. It combines great adventure with even greater values - they won't even realize that they're learning! Such a wonderful history lesson! This wonderful story is based on a true story and is about a German family who settled on the new American land, in the Blue Mountains of Pennsylvania. They lived by the word of God and worked together to survive in this new land. It wasn't until the Penn's Creek Massacre that things took a dark turn for the worse. The two young daughters get ripped away from their family by Indians who murdered their father and brother. Holding on to their beliefs that God would keep them safe and guide them home to their mother and remaining brother one day, the girls were brought up as Indian maidens, separated just months after capture to live in separate tribes. It's not until years later when hope starts to creep back into their hearts. Once I began reading "Alone Yet Not Alone", I was hooked. It was hard to put the book down at night, I wanted to know what happened next! This is a touching story that will remind everyone just how important faith in God can take you. From a girl who believes in God but don't go to church as often as most, this is a WONDERFUL book and I can gladly say that I LOVE "Alone Yet Not Alone". I do my best to raise my daughters to be strong independent women and I hope they grow up to be half as brave and strong as the girls in the story. 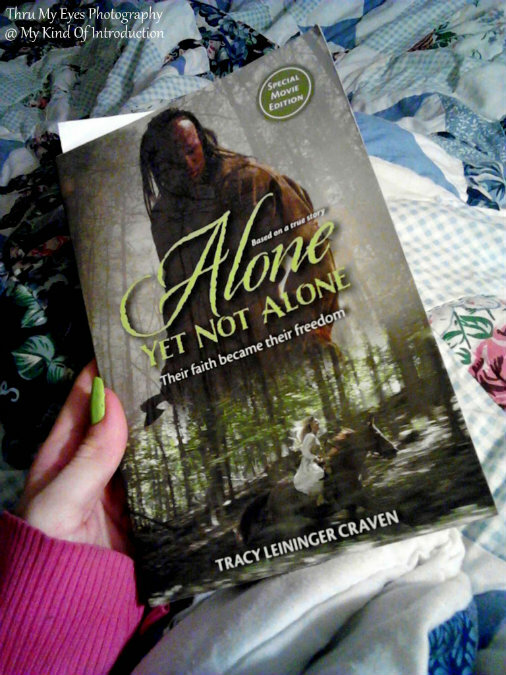 I'm not sure I could survive something as scary as the French and Indian War but after reading this outstanding and emotional story, I'm amazed at how strong some people can be when their life depends on it and how they can hold on to their faith in God after all that hurt and pain. Something else that's just as wonderful as the book is that the movie "Alone Yet Not Alone", based on the book, is being released on September 27, 2013!!! That's right! Keep your eyes out for this wonderful inspirational story on the big screen! I promise that "Alone Yet Not Alone" will be a book and movie that you'll remember for years. Or check it out on Facebook and Twitter. Want to Win a copy of "Alone Yet Not Alone" for your family? Enter the giveaway below for your chance!! School is back in session but that's no reason to miss this wonderful opportunity to take advantage of the Gymboree Labor Day Sale!! Get an extra 40% off of already reduced items!!! This deal runs through September 2!! Hurry, there's not much time left! 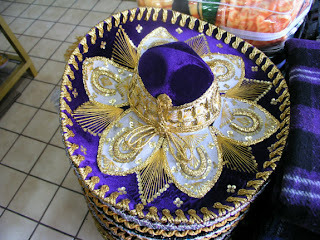 While your at it, you can also receive 30% off of all regular priced items!!! Awesome right?! Snag your Labor Day deals with Gymboree! "Every-one is good at atleast 1 thing! How many Zombies do you know? I bet you have at least one friend who's waiting for the Zombie Apocalypse! Am I right? What about Bats, Vampires, Werewolf and all those other Creepy Monsters? Has your addiction (or your friend's addiction) worn off on the kids? If you have kids that are Monster Fans then they are sure to LOVE the Lil' Creepers! With the Lil' Creepers, you get to follow the adventures of a little Zombie named Brenna. 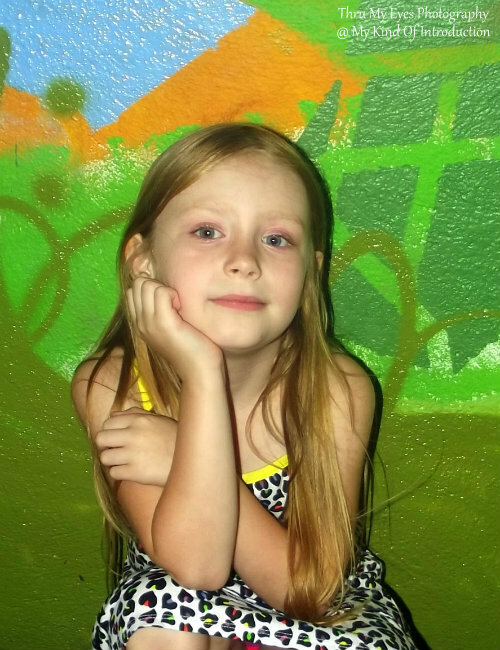 Brenna cooks, colors, plays with her friends and much more! These adorable monsters are "creepy" enough for the Pre-Teens and Cute enough for the Pre-School/Elementary Age kids! Either run and play with their new item or continue doing before the mail showed up. Our package routine is quite fun and seeing the girls search the house for a box of crayons that I knew was in the bathroom, was very entertaining. (Don't ask why the crayon box was in the bathroom, I'm still wondering about that one myself. When I asked Loran, she laughed in my face and walked off!! No joke!) I finally retrieved the Crayon Box for the girls and they headed straight to their bed to stretch out and color! Loran said that she loves the "Creepy Monster Characters" while Jade mentioned that she likes the bat picture that her sister colored. She said that what she loves most about her new Lil' Creepers Coloring Book is all of the cool coloring pages for them to color. Jade also enjoys the fact that the pictures are drawn and not the perfect computer-made lines! I also love the drawn pages! (My friends and I steal the coloring book after the girls go to sleep and color a few pages!! I know I know it may sound mean but Jade and Loran enjoy finding our pages when they flip through their book!) Shawna is a WONDERFUL artist, I bet her daughter is one proud little girl! (Shawna's Lil' Creepers Series are based on her young daughter named Brenna) I love how every illustration that's affiliated with Lil' Creepers are pieces of art! If you visit the Lil' Creepers Website, you'll see exactly what I mean when I say that Shawna Carter is an outstanding artist! I can draw but nowhere near as good as this girl! 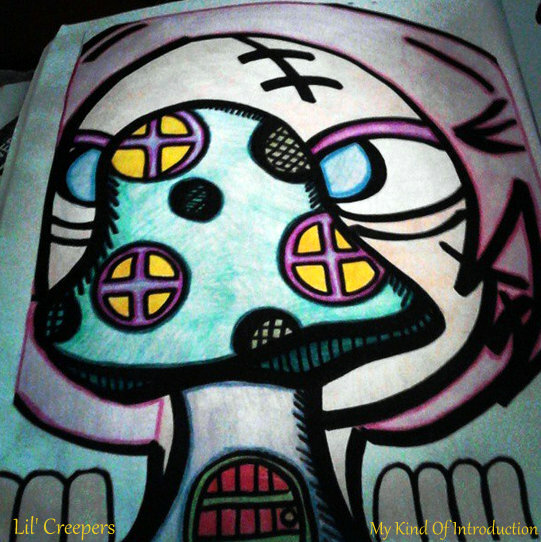 Each coloring page in the Lil' Creepers Coloring Book is unique and different! You get to meet Brenna and all of her friends through simple but detailed coloring pages pages, not to mention the brightly colored book cover! I bet your kids will keep up with this coloring book for atleast 1 week longer than normal! :) Jade and Loran are still coloring in their new coloring book and find a new details that they didn't notice before! Make sure you also check out Shawna's Kids Cookbook called "Cooking with Creepers" - A friend of mine did a review for "Cooking with Creepers" and her little ones loved it just as much as my girls enjoyed the Lil' Creepers Coloring Book!! That tells me that Lil' Creepers are a BIG HIT with little ones! Who don't like Adorable Creepy Monsters?!?!?! Shawna was so kind that she not only sent my girls and I a Lil' Creepers Coloring Book for review, She also sent another Coloring Book to use as a Giveaway on the blog!! You know what that means... right?! 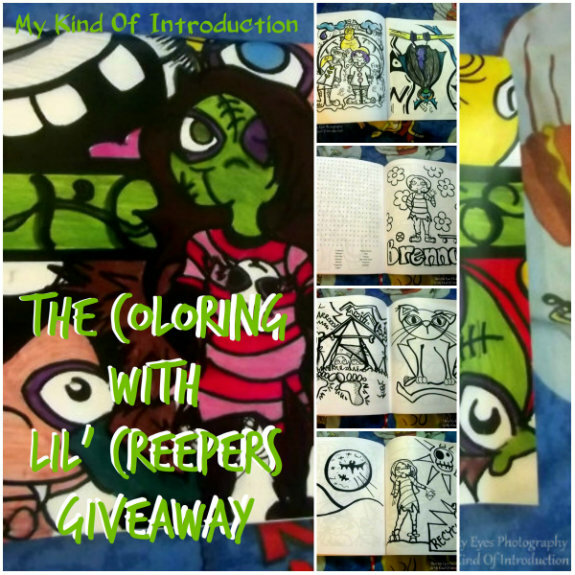 You all get the wonderful chance to WIN your very own Lil' Creepers Coloring Book!!! Are you a organization trying to earn money for an important cause but don't know where to start? Launching a Teespring Campaign may be just what you need! I'm glad you asked... Let me explain! Teespring is a crowdfunding site that allows you to design custom t-shirts for your organization, company, event, etc. One you complete your design, you get to set yourself a goal of how many shirts you want to sale along with the price per shirt. Your shirts won't ship until you meet your goal in sales! Which means that you don't have to worry about getting stuck with the bill, chasing after people with their purchases trying to collect money, guessing sizes as well as guessing how many shirts you may need to print. Teespring does all of that for you! If you don't meet your goal by the end of your campaign, your shirts don't print... It's that simple! You get a custom link once you launch your campaign that you can share with all of your family and friends as well as your supporters! Of course you can sale over your goal amount of T-Shirts! Your sales will keep growing throughout your campaign and if you happen to reach your goal, your shirts will be printed and shipped. You will also receive a check for your profits soon after!! These profits can be used for ANYTHING! 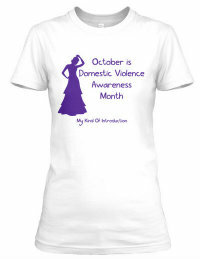 I recently launched my first Teespring campaign in hopes to earn money for Domestic Violence Awareness! It was super simple to set up and the only thing I struggled with was deciding on the final design!! You can upload your own artwork or use one of the many design choices that are already available! You can even add text with a big selection of font styles! Add a title and description to convince people to purchase your shirt, and your ready to go!! Not only can you promote your T-Shirts using the custom link, you can also share it straight from the site! You can share via Facebook, Twitter and Pinterest from the share buttons at the top of the campaign page! To learn more about Teespring and Launching a Campaign visit the Teespring website today. This post may contain affiliate links, view full disclosure policy for details. Finding the extra money to take your kids to the movies is getting harder and harder to do these days. Bills pile up and home supplies have to be bought, next thing you know, we're out of spending money and family movie day has to get postponed, or at least changed up a bit to better fit our abilities. Family Movie Day don't have to be completely canceled when you realize that your budget don't have room for a family's worth of movie tickets and snacks. Try a few of the idea's below to spice up your next Family Movie Night! Dealflicks is like Priceline for movie tickets!! -- Did you notice all of those empty seats on your last trip to the movies? Did you know that $40 billion dollars are spent each year on movie tickets, soda and popcorn, but about 88% of theater seats are empty! Dealflicks partners with many theaters to help fill all of those empty seats by selling mot only movie tickets online but popcorn and soda as well for up to 60% off! No convenience fees, 24/7! 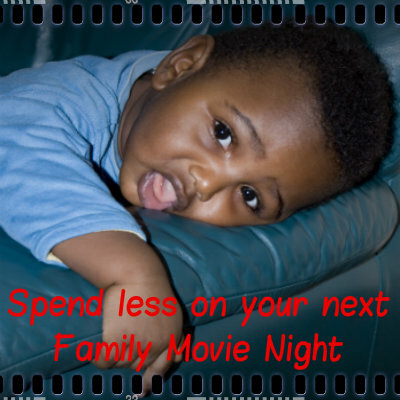 Enjoy your Family Movie Night with discount prices! Use the code READERSCHOICE for an extra $5 off!!! A Homebound Movie Night -- Choose a family movie that everyone agrees on (Maybe a new movie no one has watch before or check on Netflix) Pop some popcorn, pour drinks, turn the lights down low and have some family time on the couch while watching a family movie! Acting Out -- With snacks and drinks prepared, have the kids act out different parts of their favorite movies, they can even dress-up like their favorite characters! Be creative with the costumes and don't be afraid to join in on the acts! Mommy needs to have fun too! Playwrite -- Find one of your child's written stories or have them write a new one. They can act out their own story they way they want to! Don't forget to encourage them to dress the parts! Lights-Camera-Action -- Video tape your kids acting out their creative stories and watch their mini-movies after the taping is done. If you end up with a collection of your kids' movies, you can have a Family Movie Night where you watch nothing but the movies acted out by your kids! WHAT FUN!! Do you have any other ideas for cheap Movie Night options for families? 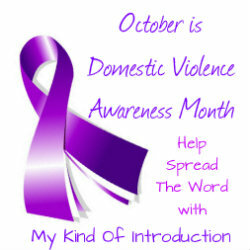 October is Domestic Violence Awareness Month and I'm planning on focusing alot on the subject very soon. I'm planning big things around Domestic Violence Awareness and I hope to see you all in October to help spread the word and save lives! If you happen to be interested in helping out, My Kind Of Introduction is also accepting product donations, monetary donations, sponsors for Awareness Campaigns and much more; in exchange for promotion of your company/brand. Contact me, Autumn B, via email at AutoFaerie@gmail.com to discuss with more detail. All Donations of Products/Monetary Donations will go toward Domestic Violence Services in Buncombe County, NC. My Kind Of Introduction is partnering up with the blog 3sonshavei during the month of October to help spread Domestic Violence Awareness. Be sure to give her a visit as well! Funny and Vintage T-Shirts for Everyone on your List! This post contains affiliate links, see full disclosure for details. Crazy Dog's quickly growing T-shirt collection includes their funny t shirts, custom screen printing in Rochester NY, costumes as well as many crazy designs. From their imagination and customer submissions they've been able to invent unique funny tees for anyone who needs a good laugh. All shirts get printed on super soft cotton t shirts and are extremely comfy! All apparel created by Crazy Dog is silk screened on location in their warehouse in New York. Between their Ninja, Bacon, and Zombie tees, Crazy Dog has an ever growing selection that will cure anyone's shirt addiction. A fan of vintage? They've got what your looking for as well! Even if vintage t-shirts aren't on your list for today, they truly have something for everyone. From the best zombie hunter gear to retro designs and cheap tee's for men. Cheap shirt deals start at only $6.99 and several shirts are just $9. You can also find a wonderful classic collection from popular movies, and television shows as well as many 80's tees. Their styles really know how to bring back fond memories of our childhood movies. Lots of designs on hoodies to keep you warm and laughing as well! From offensive to graphic and much more. Crazy Dog T-Shirts are truly has the top t-shirt design collection around!! "Where did you get that awesome shirt at?" Crazy Dog has given me the chance to offer my readers a 10% off discount of their FULL inventory!! These T-shirts make wonderful Holiday Gifts!! Time to stock up on warmer clothes for the upcoming Fall Season! Zulily is having a wonderful sale going on right now where you can save up to 90% off selected items!! The collection of clothes at Zulily is outstanding! You can find many designs that are sure to match your child's personality. Don't miss out on this wonderful deal! You never know when these savings will be gone! While on a road trip with kids, it can be hard to keep everyone occupied. Kids get bored easily and while coloring books and crayons are fun, they run out of interest with them pretty quickly. Try out a couple of the ideas below on your next road trip and see what works for your family!! When you stop at a gas station or rest stop, grab a map. Hopefully you keep a couple pens or markers laying around the car /in your purse, or you can use a crayon. 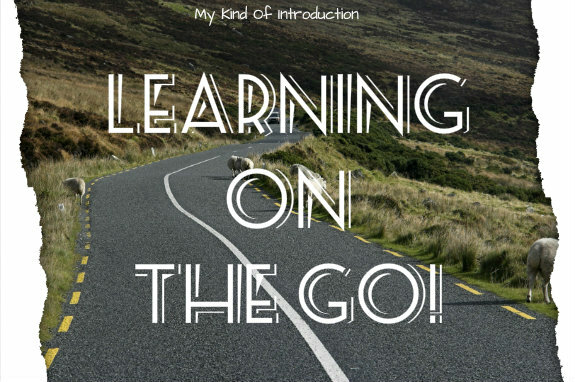 Draw a line through the road or area that you've driven through and keep track of where your going and where you've been. If you stop at a store, look for small stickers, even yard-sale dots, you can add them to the map as well. You can also collect tiny rocks or pebbles and use them for Math Problems. For Example - Pick up a few pebbles at a rest stop or use pennies, etc. - Mom hands the child 4 pebbles, Dad hands the child 3 pebbles. How many pebbles does the child have now? If you have paper or a notebook, have the kid(s) write down the math problem as it's happening to help them figure it out. 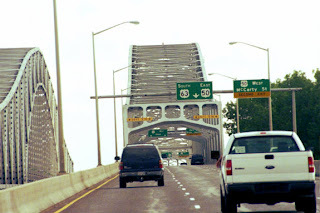 If your driving through a state that's different than your home state, Play the Tag Game! To Play the Tag Game you'll need a piece of paper and something to write with. Then simply keep an eye on the tags of passing cars. 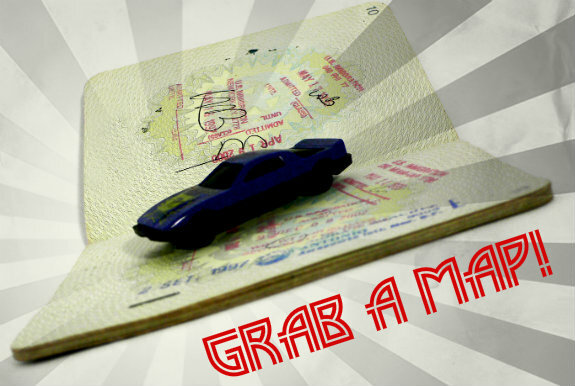 If you find a car from your home town then you can put a tally mark on your paper. You can play it many other ways as well. For Example - Write the Current State that your driving through at the top of the paper. Keep an eye on the passing car tags and when you see one from a different state than the current one, write it down and add a tally. 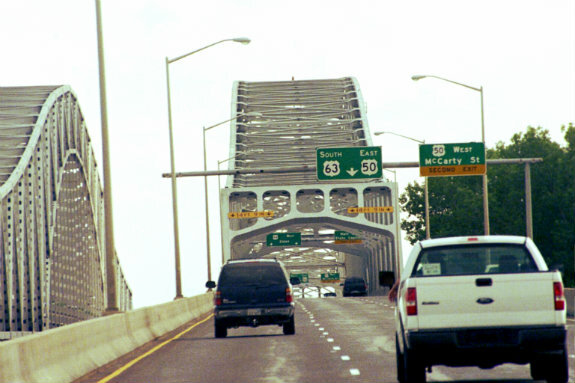 See how many different State car tags pass through each state that you pass through! Don't forget that your car has a tag that may be different than the current state that your driving through so that counts as a tally too!! If you have crayons or markers - Try using a matching marker to the color of the cars. Doing this will let you see what color cars are popular in the states that the tags/cars are from. You can also use the Road Signs as learning boards! 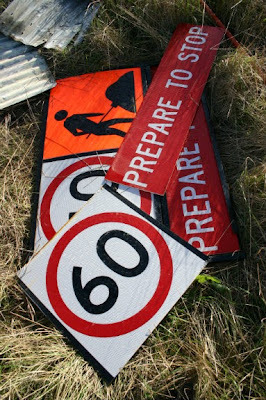 Ask the kids to read the road signs out loud. See how many of them they sound out correctly! Playing I-Spy is always a fun way to incorporate colors into a road trip trivia game! "I spy with my little eye... Something Blue" The answer could be: The sky, a car, paint on the store, a road sign, or anything else you may be able to see from your car. Once the kid(s) figure out what you spy, the one who is right - Gets to spy next. I Spy is also a great game to play in a plane, a train or even a bus! Make a Field Journal before you start your trip. Use a pre-made Notebook and come up with questions that you would like answered while on your trip. Do you know what states or cities that you will be traveling to or through? You can also Make-Your-Own Notebook - Use lined paper as the center and 2 solid colored pieces for the front and back. Staple it together or punching 3 holes and tie the sheets together with string. Use Questions Like -- What is the State Bird, State Flower, State Capitol, etc. Mark off a few pages for Post Cards, Maps, Photos and other small State Finds. You can even collect food labels from products that are only sold in that city or state. Tape or Glue Collected Maps and Postcards as well as pictures that you take throughout your trip, on the extra pages! I hope your next family road trip is 10x more fun when you start including some of these awesome little car games!! I love the look of the gifts after being wrapped with the stylish eco-friendly gift wrap from The Green Daisy! They kind of look "up-class" and I can't get enough!! Now you can enjoy them too! Visit Pea of Sweetness to read her full review of The Green Daisy products. Use the code Sweetness on your order at The Green Daisy at checkout to receive 20% off your order! Yellow-Green Dot Washi Tape, a Bough Notebook, and Butterfly Drift Gift Wrap! Looking to make money at home? 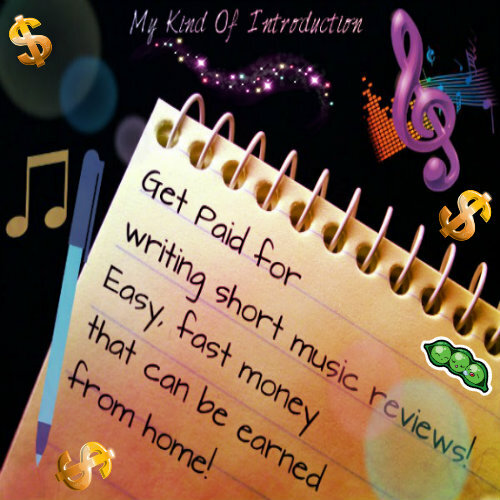 I recently ran across a great website that allows you to Write Small Music Reviews and get paid for it! All you do is listen to a short song, Rate the song from 1 - 10 and then write out a short review. The amount you get paid depends on each review. For example: If you write a very descriptive review with lots of detail today and tomorrow you write a review with less details... You will make more money with your first review than you would on your 2nd one. The better the review -- The more money you make!! Slice the Pie is a great way for Stay-at-home or Work-at-home moms to make extra money on the side! You "work" on your own time and can do as little or as much as you like! Sign up for Slick the Pie and start Earning today! Craftsy now has Photography Courses!! Craftsys goal is to revolutionize online education by giving photography enthusiasts the chance to be on location with world-glass instructors learn many professional techniques as well as engaging with instructor and fellow students! As a student, you are able to make digital video notes, ask questions as week as getting the chance to learn using the latest tools!! Shoot It: Product Photography Class -- No need to have expensive and fancy equipment/cameras to take great pictures, all you need is the knowledge that you'll learn in this wonderful class!! Portraits With an On-Camera Speedlight -- Use light and bring your portraits to life!! Learn how to use the light that's available light and learn advanced on-camera flash techniques with Neil van Niekerk. Kirk Tuck: Studio Portrait Lighting -- Photographer Kirk Tuck shows students the equipment, setup & lighting techniques that will be needed to create breathtaking and professional-like portraits. Shooting Intimate Landscapes -- Turn the ordinary into extraordinary! 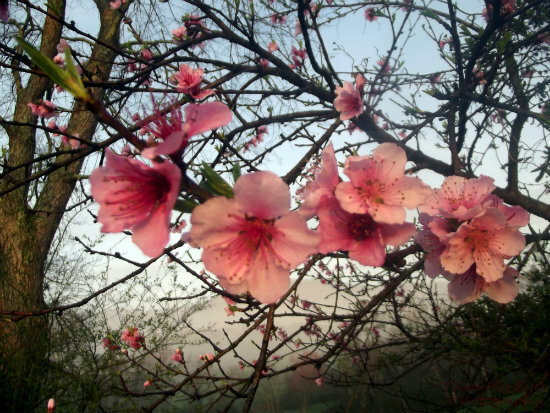 Travel with Rob Sheppard and discover beauty on a smaller scale and learn to find intimate landscapes anywhere! Landscape Photography: Great Sand Dunes -- Take a journey with Photo Guru Rixk Sammon and enhance your landscape photos from blah to breathtaking in minutes with this spectacular online class! Off-Camera Flash Photography with Neil van Niekerk -- Put your subjects in their best light no matter what setting by taking your speedlight off-camera and create wonderful portraits! The folks over at CleverRelish, the creators of WipesWraps want to brighten up your decor! Mama's Mission received a few of these awesome baby wipes tub cover ups and was so pleased with them that we've organized a giveaway so you can have some of your very own! So read on because 4 people have a chance to win a pair of WipesWraps to #BanishTheUnsightlyTub! We all want our children to be great readers, don't we? Learning to read helps our kids learn more words as well as growing their speech and vocabulary! The only problem is that it can be tough to get a child to sit still and stay interested when you read to them or ask them to read for you. Unless you start reading at an early age, your child may have other interests. Reading Eggs is made to not only to help teach your child how to read, the program is fun and interesting so the kids won't get board and won't even realize how much their learning! 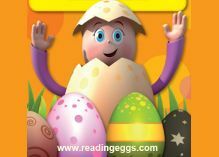 The combined work of Teachers, Educational Writers, Web Developers an Animators - The Reading Eggs program is full of many online games and reading activities that will have your kids begging to play! What's cooler than Songs, Games, and even Rewards like Golden Eggs and more! Your child(ren) will grow to be proud of themselves as well as you being super proud of your kids as well!! Once the kids are proud of themselves, they'll be motivated to keep going. From the age of 3, your child can benefit from Reading Eggs. They have a wonderful early childhood education program where playtime is the perfect time to start learning. Once your child reached 5 and begins heading to school, use the program to help them build and enhance the reading skills that they're already learning at school. If your child is 6 or 7, she can still benefit from Reading Eggs! Your child will receive a placement test that will make sure they are placed at the right skill level. They also have a program called Reading Eggspress for kids that are from the ages of 7 - 12! Reading Eggs really does have something for all of our growing readers!! Using skills and strategies that are set to ensure reading success, Reading Eggs has signed on more than 500,000 subscribers as well as presented more than 15 million lessons in just North America alone, since launching in the US and Canada in 2011!! to receive a FREE 5 Week trial from Reading Egg! Simply click the link above to snag your FREE 5 Week Trail! You don't want to miss out on this great opportunity! Every child from the ages of 3 - 12 can benefit from The Reading Eggs program and I'm promise you that your kids will enjoy the games and fun characters and learn more each time they turn the program on! Try Reading Eggs out today!